Computer 1: Hey, I hear people! 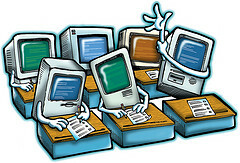 Computer 2: Woo hoo, that must mean school is about to start! Computer 3: And it means someone is going to turn us around, brush the dust off us, and plug us in! Computer 4: Amen, because I am sick of looking at this wall. Are your computers unplugged? Are the cords in a pile? Do you need help getting everything connected and turned on? This presentation will take you through the steps to connect your computers properly. If you have difficulty with this task or run into a problem, please submit a TSR through the HelpDesk ticketing system. Technicians will address TSRs in the order received.